Winnipeg, Manitoba – The Winnipeg Goldeyes announced on Wednesday that the Los Angeles Dodgers organization purchased the contract of all-star 3B Wes Darvill. Darvill will report to the Dodgers’ spring training complex in Glendale, Arizona next month where he is expected to compete for a roster spot at the Double-A level. 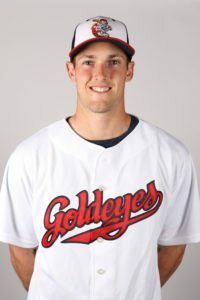 Darvill has played for the Goldeyes each of the last two seasons, helping Winnipeg capture back-to-back American Association championships. Last year, the Langley, British Columbia, native hit .309 with 53 runs scored, 19 doubles, four home runs, 49 RBI, and 30 stolen bases. Darvill was the American Association’s starting third baseman at the All-Star Game on July 25th, and was later voted to the league’s Postseason All-Star Team. During his two seasons in a Goldeyes’ uniform, Darvill has stolen 48 bases in just 51 attempts. Since 2016, Darvill owns a .953 fielding percentage at the hot corner, while fielding more chances than any third baseman in the American Association (532). A left-handed hitter and right-handed fielder, Darvill has also proven clutch, hitting .301 in a combined 229 at bats with runners in scoring position. In postseason play, Darvill batted .319 during the 2016 and 2017 championship runs, and collected at least one hit in 17 of 19 playoff contests. Darvill provided one of last year’s most memorable moments when he connected for a three-run, walk-off home run against the St. Paul Saints on July 18th. This marks the second opportunity in affiliated baseball for Darvill who was originally drafted by the Chicago Cubs in the fifth round out of Brookswood Secondary School (Langley, British Columbia) in 2009. The 6-foot-2, 190-pound Darvill played seven years in the Cubs’ system, reaching the Double-A level twice, and earning an assignment to the prestigious Arizona Fall League in 2013. Including his time in Winnipeg, Darvill has been at least a full year younger than his league’s average age during his nine years of professional baseball. Darvill’s contract is the 73rd sold to a Major League organization in Goldeyes’ history.